Kids love toys that can be out of this world. They would love toys that they can associate with the things they love. For those who are avid fans of Batman or the Justice League, the new Justice League Ultimate Bat Mobile toy can certainly take anyone’s breath away. The new Justice League Ultimate Bat Mobile is an intricate and stunning and functioning replica of the Bat mobile from the new Justice League movie. This collectible toy comes with functioning parts that any avid fan of Batman will salivate for. First and foremost, it is a remote controlled car that kids can control using an app on any smartphone or tablet. Not only that, it also has a built-in camera located at the vehicle’s cockpit. This provides users with a driver’s POV while playing with the toy. The new Justice League Ultimate Bat Mobile also features special dramatic effects that make it quite similar to the one in the movie. The engines roar and smoke comes out of the tailpipe. The vehicle also has a jump mode that will elevate the Bat mobile for prime targeting. 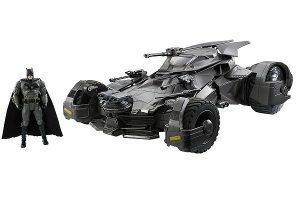 There are rotating machine guns, pivoting cannons, and four missiles can fire from the hood of the car as Batman brings it along to fight the super villains. The Justice League Ultimate Bat Mobile is for the avid teen collector of Batman memorabilia and toys as well as for those who wanted to have a cool toy. Ideal for kids from 14 years old and above, this new Bat mobile is available at Amazon for $220.